[i am a dekaphobic]: The Winners of 2nd Anniversary Giveaway #2: Akiba Cafe! The Winners of 2nd Anniversary Giveaway #2: Akiba Cafe! 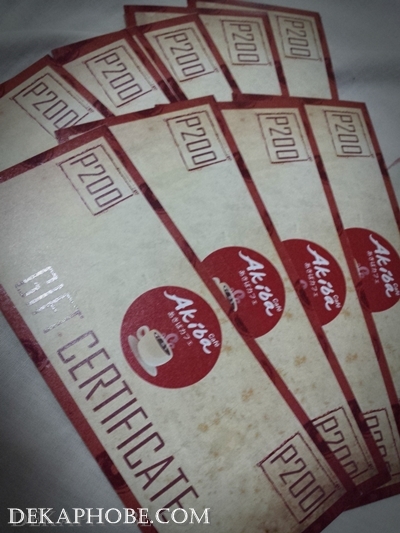 Five winners will receive Php 400 worth of GCs from Akiba Cafe. Again, thanks to Kenn Ong of Akiba Cafe. The GCs may be used at any Akiba Cafe branch (SM Megamall or Ash Creek, San Juan). 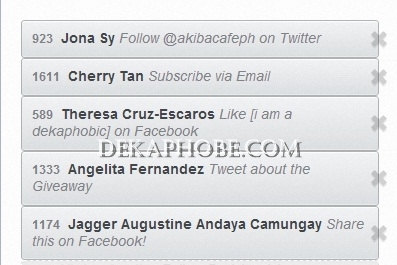 Congratulations Jona Sy, Cherry Tan, Theresa Escaros, Angelita Fernandez and Jagger Camungay! Kindly wait for my email on how to claim your prizes.